When not worn as athletic wear, gymslips or pinafore dresses are generally worn over a blouse and replace a skirt. A blazer may be worn over the top. 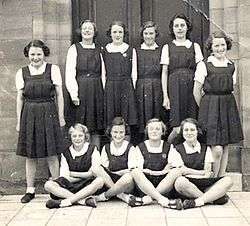 First emerging in the 1900s, by the 1920s it had become compulsory in many private, convent and high schools, and thus became commonly worn by girls as part of their school uniform, together with a [blouse]].